Baker: Demons and other Night Things continues the Night Things saga in this prelude to the Magic Now series. Baker Johnson is a psychical researcher, demonologist and exorcist living in 1930s New York City. Brilliant but deeply flawed, Baker has an otherworldly perception that allows him to read people with but a glance. In “A Weird Tale” (the story begun at the end of Night Things: Undead and Kicking), Baker is summoned to Providence by dying author of the macabre, H.P. Lovecraft. Lovecraft makes a confession that threatens Baker’s life and sanity. In “A Fiend’s Errand”, Baker is approached by a dangerous mobster known as Johnny Stücke. Baker’s black room, a place where haunted items are cataloged and kept, holds an ancient item that Stücke is determined to possess. Baker is introduced to the secret society known as the Night Things. And he may be the only thing standing between the world of man and the most dangerous threat it has ever known. Also included are the previous Baker Johnson tales, “The Giving of Things Cold and Cursed”, “Servant of the Red Quill” (with an introduction by Paula Cappa, author of The Dazzling Darkness), and “The Dark Alp”. 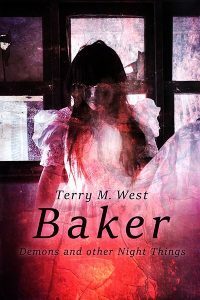 Critically-acclaimed horror author Terry M. West continues his Magic Now series with this collection that introduces Baker Johnson to the Magic Now universe. Also included: an exclusive preview of the next Night Things book, Nowhere to Hyde. This entry was posted in Audio Books, Books and tagged audio books, books. Bookmark the permalink.